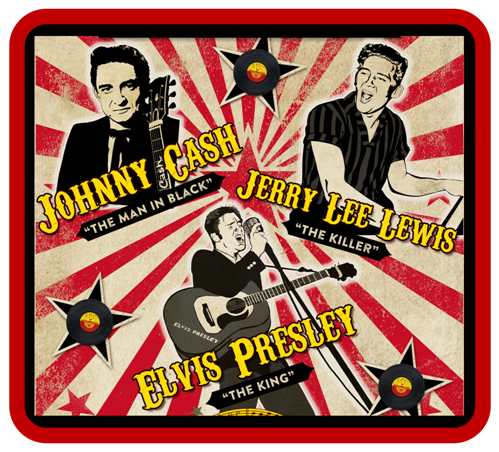 Cash, The Killer and The King is a red-hot rock 'n' roll tribute to the music of Johnny Cash, Jerry Lee Lewis and Elvis Presley! Johnny Cash is portrayed by Neil Morrow, Jacob Tolliver performs as Jerry Lee Lewis, and “The King” Elvis Presley is portrayed by Scot Bruce. This production features the hit music of these three legendary icons. The show covers the 1950's Sun Records era, and beyond. Johnny Cash, Jerry Lee Lewis and Elvis Presley were a major part of the historic jam session the took place on December 4th, 1956 known as "The Million Dollar Quartet!"